Preheat George Foreman Grill or sandwich press. 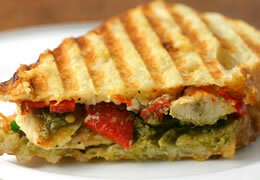 With buttered side of bread down, spread pesto evenly. layer two pieces with chicken and brie. Add spinach, greens, or other veggie if desired. Use what you have! Grill until cheese looks melted and bread is crispy!